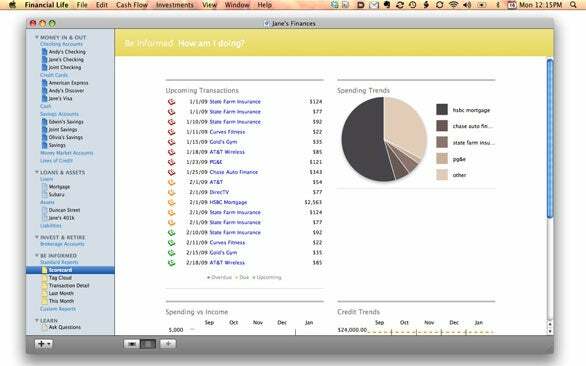 Mac users last saw a new version of Quicken, Intuit’s personal finance app, in 2006. The company hopes to change that this summer when it rolls out the completely rebuilt and renamed Quicken Financial Life for Mac. With Quicken Financial Life, Intuit is scrapping the code it used for Quicken and starting from scratch. That approach has allowed the company to not only give the app a new look but also add features that take advantage of Mac OS X 10.5. It’s also taken longer than Intuit originally anticipated—first announced more than a year ago, Quicken Financial Life missed its original fall 2008 release date. On the bright side, early indications suggest that Quicken Financial Life may be worth the wait. I had the chance to play with a beta of the retooled personal finance app. While Quicken Financial Life is still very much a beta—at this point, it’s fairly limited in terms of completed features—I like what I see so far. For better or worse, Intuit has used a checkbook-like register for recording checks, deposits, and other banking transactions, with buttons across the top of the screen for accessing each of the program’s features. While it’s impossible to completely dispense with the ledger-like look of a checkbook register, Intuit has managed to change the way you approach that ledger and the way that you interact with your banking data. Quicken Financial Life has a decidedly less cluttered feel than the current version of Quicken. A sidebar on the left of the screen, similar to the sidebar you use in Apple Mail, contains links to all your accounts and available reports. Selecting anything in the sidebar—say, your checking account—reveals a list of transactions for that account. According to Intuit, it’s going to be much easier to download this data from your bank and import it into Quicken Financial Life. Something new to Quicken Financial Life is the introduction of Tags for categorizing your transactions. Most financial applications let you assign categories to different transactions or “split” your transactions into discrete categories that make it easier to figure out where you spend your money. But typically, these categories are fairly concrete and, unless you split out an exact dollar amount, it wasn’t possible to assign more than one category to a transaction. A Great Cloud of Expenses: Quicken Financial Life now uses tags for categorizing your financial transactions. With the introduction of tags, it’s now possible to categorize your expenditures in less generic terms without losing the value of those generic categories. For example, all your iTunes Music Store purchases might typically fall under the generic heading of “entertainment,” but in Quicken Financial Life you can also add tags for applications, movies, music, and audio books, gaining a more specific picture of where your money goes without losing the big picture view of how much you’ve spent on entertainment. Quicken Financial Life is designed to help you take a more holistic approach to your personal finances, allowing you to take a broad view of your entire financial picture while giving you insight into where you currently stand and helping you make plans for the future. This is kind of a “touchy-feely” approach to finances, but one that I think has the potential to work well for many people. While it’s too early in the beta process to really see how likely Quicken Financial Life is to live up to this promise, there are two features—one qualitative and the other quantitative—that I like. 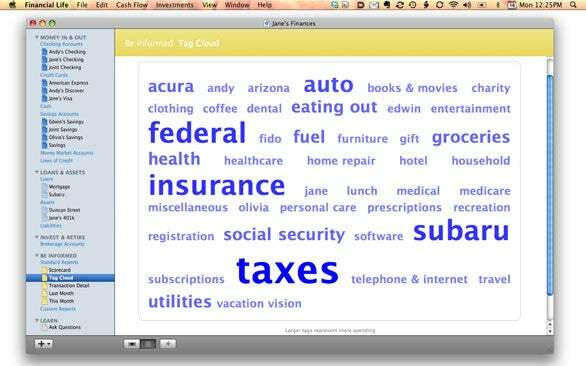 First is the program’s Tag Cloud, which, by using your transaction tags, and without using a single graph, chart or number, lets you gain a visual grip on where your money is going. It’s an intriguing feature that works quite well and which could expand into something really useful. The second, called the Scorecard, is a little more typical of your average financial application, but it differs in that it lets you see every detail of your financial life in a single view. Scorecard provides lists of upcoming and overdue bills, and details on all your assets and liabilities. There are also graphs of your spending—vs.—income trends, your credit card balance trends, and overall spending trends. Most applications would require you to open or print a half-dozen reports in order to gather the same information. The fact that Quicken Financial Life lets you see all of this information in a single location may make it easier to get a grip on your present financial situation and your financial future. Do You Know Your Credit Score? The Scorecard provides you with a one-stop overview of your current financial status. Quicken Financial Life remains a work in progress at this early stage, with many features not yet implemented. But the features that are working at this moment make this program worth watching as it gets closer to its slated summer ship date. We’ll have more on Quicken Financial Life once the finished version appears later this year.